We had a very successful and challenging mission. The shuttle undocked from the station yesterday and will be landing Friday…just in time for the holidays. We celebrated Ross’ birthday, which was yesterday, by going to Dave & Busters with some friends over the weekend. Dave & Busters is basically a video game arcade for adults. We played lots of fun games. I think our favorites were the trivia game…we won a lot of tickets…and a boxing game that Ross played. We ended up cashing in our tickets for a soccer ball and a yo-yo. 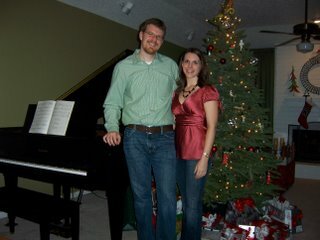 We also attended a Christmas party with all of our friends from our life group. We ate lots of food, and had a white elephant gift exchange. 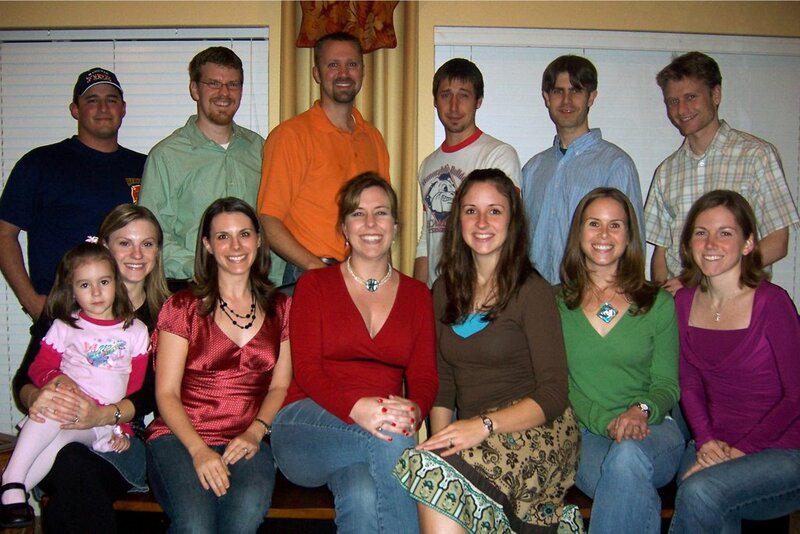 Here is a picture of everyone from that night. You can check out the rest in our album. Tomorrow we’re planning to go to Galveston to see the Festival of Lights and go ice skating. I can’t wait! I’ve only been ice skating once, so we’ll see how I do. It’s still ~75F (~25C) here. It doesn’t really feel like winter at all, so our trip tomorrow is our attempt to make it feel more like the right time of the year. I hope everyone has a wonderful Christmas and a happy New Year! 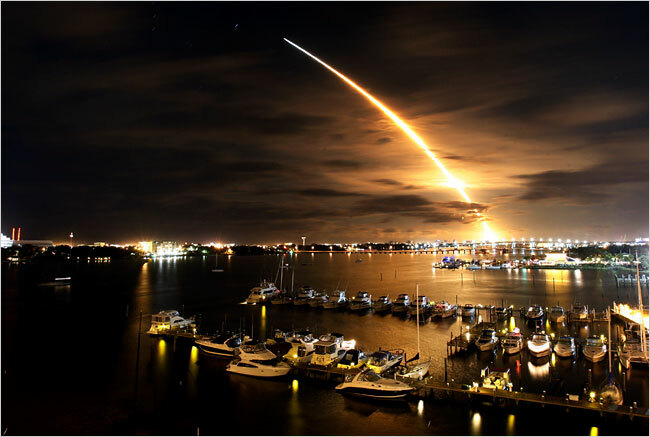 In follow up to Elizabeth's previous post, I am reporting that Discovery did indeed launch successfully with a spectacular night launch. This is great news because it means that E and I get to go home for Christmas! Of course, E and I ended up playing tag team mission support as she got home a little after midnight and I had to come in at 3 AM. Oh well, that's one of the joys of supporting the space program. Time flies when you're busy. Since Thanksgiving Ross and I have been consumed with work and Christmas preparations. We got our Christmas tree decorated and even have most of our presents under the tree. My parents came to Houston the weekend after Thanksgiving, and we got a lot of shopping done. The next weekend was a lot of fun. My best friend Barbara came to visit! We went to my group's Christmas party, decorated another Christmas tree at the church, did some more shopping, got pedicures (Ross didn't join us for that part), and went to see the latest James Bond movie. This week Ross and I participated in the 2nd Annual Space Exploration Conference here in Houston. I got to see a couple of ISU friends there. Melissa was one of the people responsible for organizing the event, so she was busy most of the time. We finally got to catch up a little on the last day. Alvin, Steve, and Marlo were also there, along with Michael Simpson. It was great to meet all of Alvin's Irish friends that are here at Rice University with him. Steve had updates on his career plans, and I can't wait to find out how everything works out. Marlo was like me...just working! Yesterday the shuttle was supposed to launch, but it got "scrubbed" for 48 hours becuase of a weather violation. Thanks to that, I haven't slept in 24 hours. I'm working the 11PM to 8AM shift tonight. Tomorrow I work 7PM to 8AM unless we launch. If we launch I only have to work until midnight! The downside is that Ross will have to work the night shift whenever we launch. We're still hoping for a launch before Tuesday. If we launch on Tuesday, we'll have to work Christmas, which would be really disappointing since I worked Thanksgiving too. We'd really like to go home and see our families! Let's hope that the weather clears up, everything goes well, and that we get to launch tomorrow! That would mean I'd get to give one of the "go for launch" calls and see a night launch while sitting on console!